One Paseo is described by One Paseo's website as a "proposed neighborhood village to live, work and play in the heart of Carmel Valley"
One Paseo is a proposed mixed-use development that (if approved as proposed) will be built in Carmel Valley in a currently mostly vacant lot that sits beside Del Mar Heights Road between El Camino Real and High Bluff Drive. 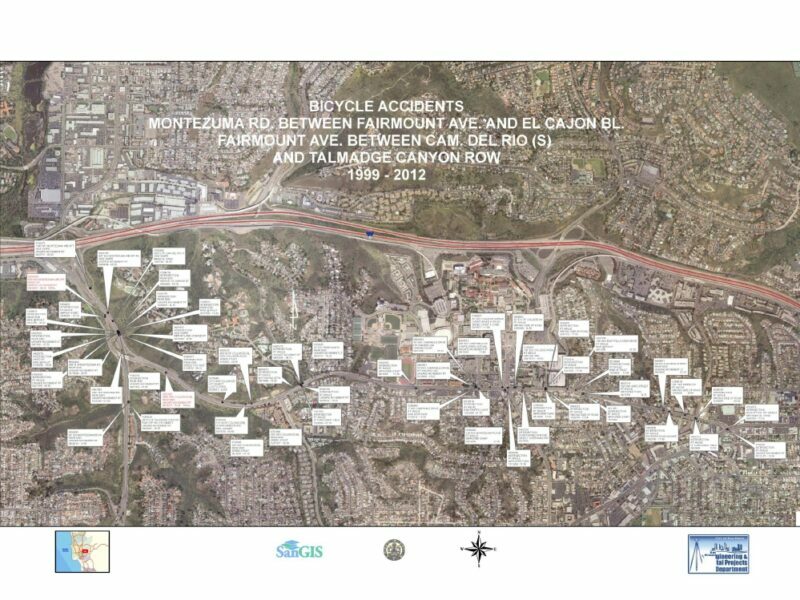 "Cycle tracks, the first of its kind in San Diego, will be lined around this gateway road, one of the most utilized streets in Carmel Valley." A little over a week ago at the Planning Commission hearing, supporters and consultants for One Paseo showed up to speak in support of the project. Many supporters spoke, in particular, about how great the project would be for bicycling and how the project would make Carmel Valley more walkable. But we didn't support the project as currently proposed. First, a correction. 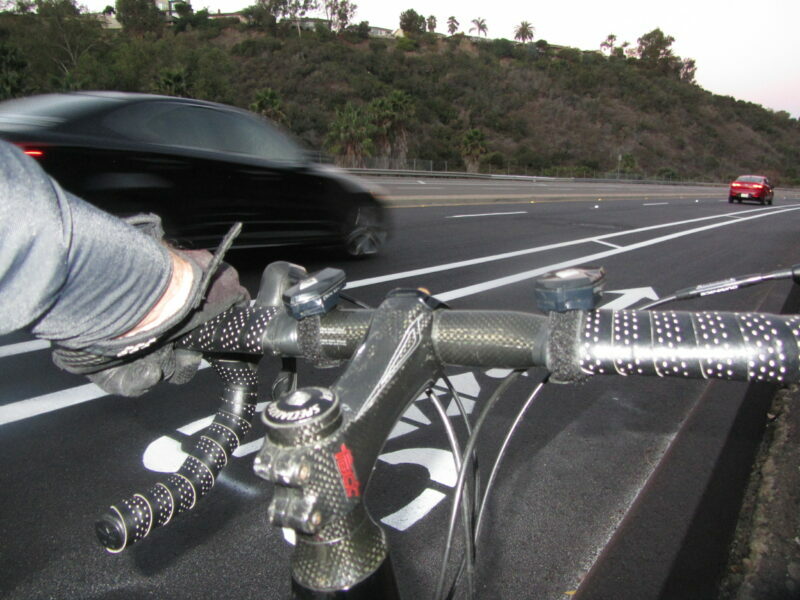 The claim that the proposed 0.3 mile cycletrack along Del Mar Heights Road in front of the One Paseo project would be the first of its kind in San Diego is incorrect. Friars Road has had a cycletrack, if a bit ill-maintained, for decades (on the southside between Sea World Drive and Fashion Valley Road). The other cycletrack on Sea World Drive has been in existence for at least one decade, thus the cycletrack along One Paseo will not be the city's first. Fact: Bicycling to One Paseo is also discouraged by the high volume, high speed 6 lane roads that bicycles must navigate. Even though bicycle lanes are provided, only the most experienced cyclists would brave these conditions. Would you let your children ride on these roads? 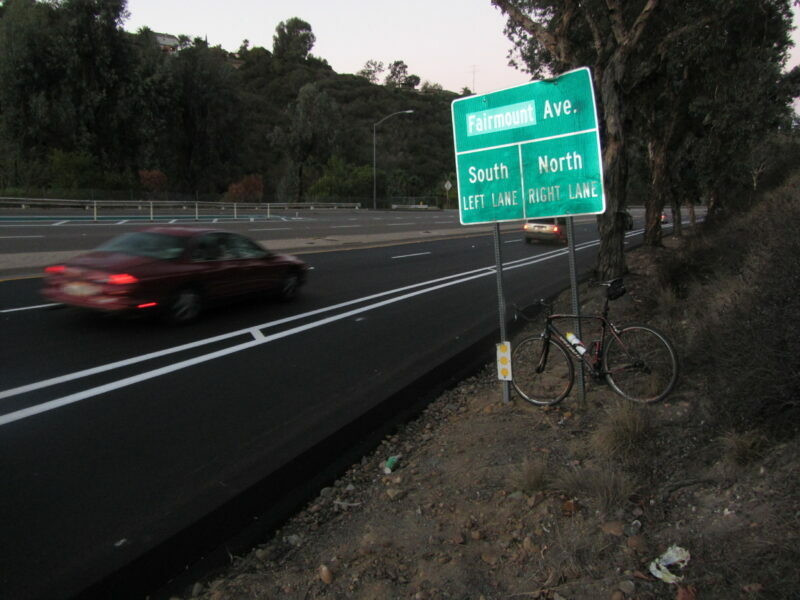 Del Mar Heights Road is generally an east-west trending roadway within the study area (Mango Drive to Carmel Canyon Road). Between Mango Drive and Portofino Drive, it has a functional classification of a five-lane major roadway. From Portofino Drive to the I-5 northbound (NB) ramps, it has a functional classification of a five-lane prime arterial, and a six-lane major roadway between the I-5 NB ramps to High Bluff Drive. From High Bluff Drive to Carmel Canyon Road, Del Mar Heights is functionally and ultimately classified as a six-lane prime arterial. The roadway width within the traffic study area is 102 feet and the posted speed limit is 40 mph. No parking is allowed along this section of the roadway. Class II bike lanes 1 are located along both sides of the road. 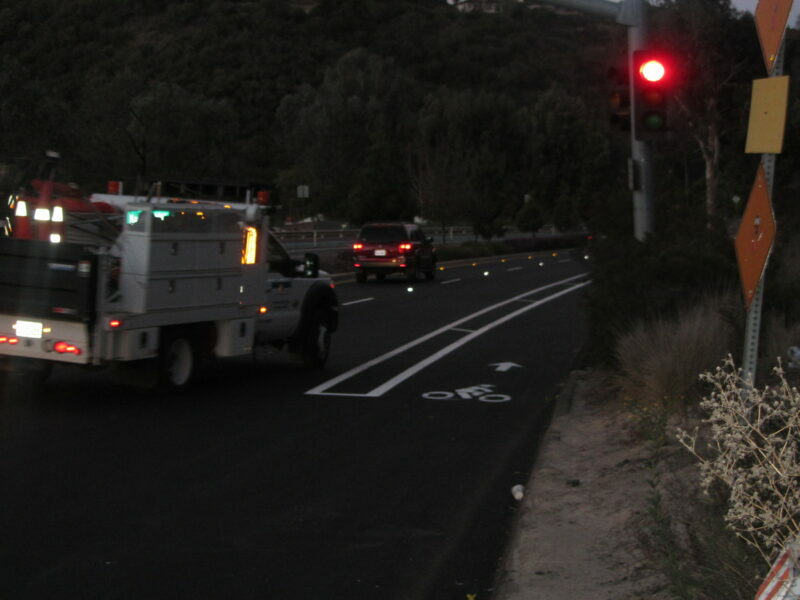 In addition, at the intersection of Del Mar Heights Road and High Bluff Drive, prior to the issuance of the first certificate of occupancy for Phase 2, the applicant must (1) widen Del Mar Heights Road on the north side receiving lanes,re-stripe the northbound, left-turn lane, re-phase the signal to provide northbound triple left-turn lanes, and modify the eastbound and westbound left-turn lanes to dual left-turn lanes; and(2) widen the eastbound approach by 2 feet on the south side to accommodate the eastbound and westbound dual left-turn lanes (MM 5.2-7). One of the first major efforts we undertook after we launched as an advocacy organization two years ago was to advocate for narrowing the travel lane on Montezuma Road after Chuck Gilbreth was killed. Our reasoning then (as it is now) is that wide roads induce high vehicle speeds which makes bicycling (and walking) conditions dangerous. This is substantiated with research and data from government agencies, transportation researchers and more. Motor vehicle crashes, which are the leading cause of unintentional injury deaths in the United States each year, killed over 30,000 people in 2010. Vehicle speed is a major factor in many of these collisions, and higher speeds are especially dangerous for pedestrians and cyclists when collisions occur. Multiple factors contribute to the problem of unsafe traffic speed. Among the most common are road designs that encourage higher speeds, speed limits tha tare set too high, and speeding (people driving faster than the speed limit or too fast for road conditions). Speeding is the most studied of the three factors. 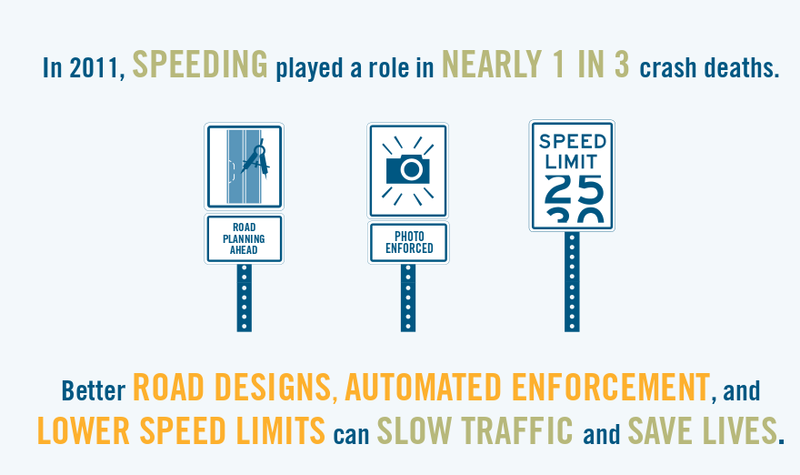 Police reports indicate that speeding played a role in nearly 1 in 3 crash deaths (9,944 people in 2011). In fact,almost 9 out of 10 speeding-related deaths took place on non-Interstate highways, most of which have speed limits of 55 mph or less. But One Paseo calls for widening the already wide road while simultaneous calling the project walkable/transit friendly and bikeable. Meanwhile the author of Walkable City, Jeff Speck, calls (perhaps in vain) for the reduction of vehicle travel lane widths. But here in San Diego, city staff recommended the project be approved by the Planning Commission. 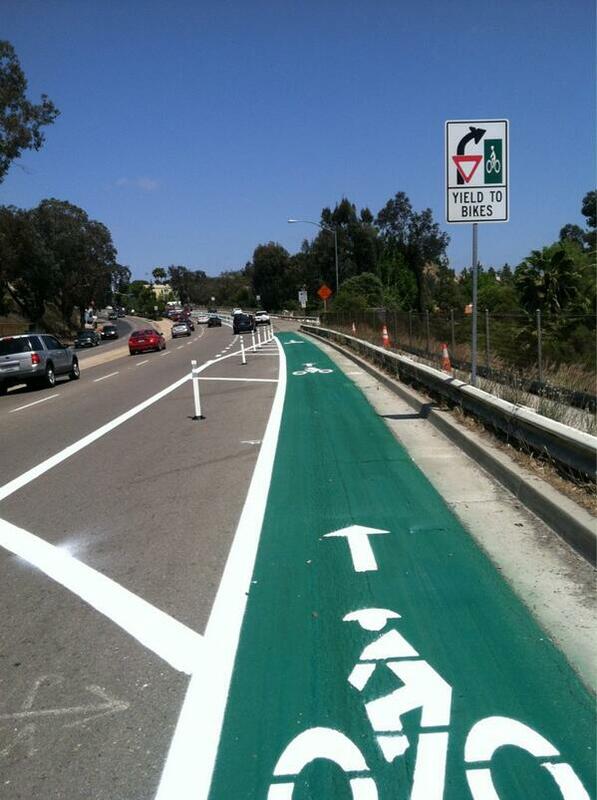 The One Paseo project was endorsed by the Move Alliance and by the San Diego County Bicycle Coalition, among others. If you are horrified at the thought of San Diego widening on our already wide roads while relying on Level of Service as a metric of environmental impact (despite being dead to the state), I'd encourage you to consider emailing the Planning Commission at: planningcommission@sandiego.gov. The Commissioners are scheduled to continue their deliberations this Thursday and will vote on the project. If they support it, it will go on to City Council for the final vote. If any of you were complaining about the lack of love for bicycle facilities on the north side of Montezuma Road, rest easy. 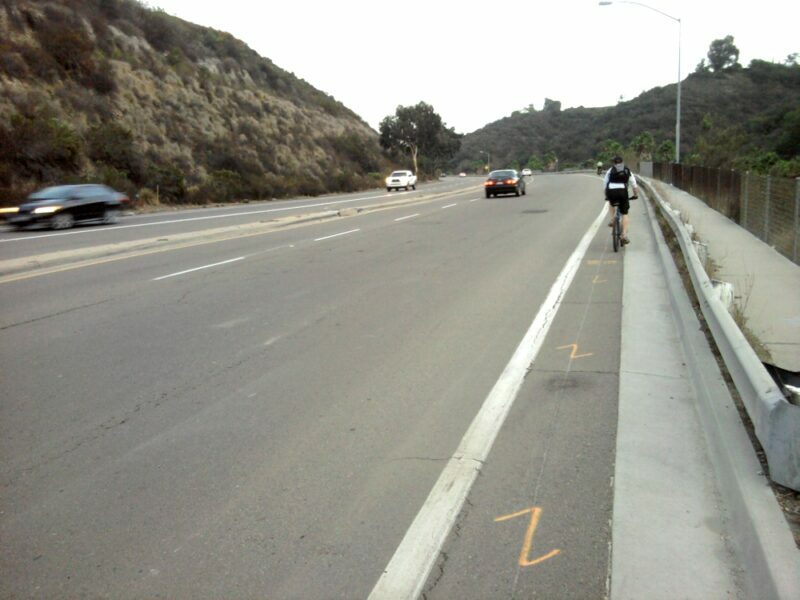 Robert Craddick sent in photo documentation of the newer wider bike lanes complete with painted buffers that went in earlier this month. 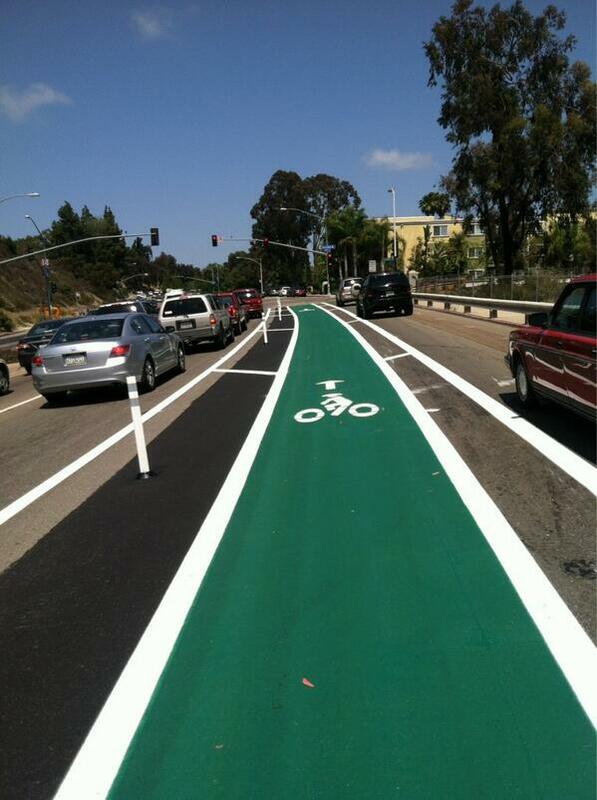 Have you had a chance to check these new bike lanes out? What did you think? Craddick offered this comment: "Really nice job!" Montezuma Road stands as something of a poster child for failure: it is a city road linking the thick populations and work centers of College Area, Rolando, parts of City Heights, La Mesa and beyond with Mission Valley and points west and north. Yet, it has wide lanes, high speeds, and a general layout that seems to forget that fleshy humans inhabit the city and that pedestrians and bicycle riders might also use this important route. The road has taken lives. This morning, on Bike to Work Day, we learned that the eastbound (from Fairmount Avenue to Collwood Boulevard) side got the Genovese Treatment. Brian Genovese, Head of the City’s New Multi-Modal Section, leads a novel effort: to use state-approved design guidelines and the city’s resurfacing & slurry seal program to create buffered, visible, and much safer and more facilitative Class II bicycle lanes with little more than paint, political will, know-how, and changing the way traffic engineers think. These projects are “low hanging fruit” because they are already approved at a state level and resurfacing projects already require new paint. But instead of relegating bicycle riders to an afterthought, the city has begun to understand that many of our roads create hazardous conditions for riders – and for people who would like to ride. 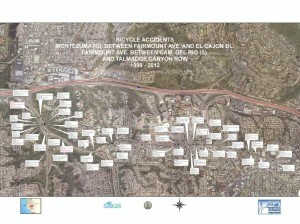 “Montezuma between Fairmount and El Cajon looks like a freeway and drives like a freeway for the western segment.” That was the description Brian Genovese, City of San Diego’s Senior Traffic Engineer for the Multimodal Program gave at last Wednesday’s College Area Community Council meeting. Unfortunately, that’s the way it may remain if other members of the Multimodal Program decide to stick with their track record of upholding the status quo. As he pointed out, the City of San Diego Bicycle Master Plan designates a Class II Facility along Montezuma which, by current standards, already exists. Nonetheless, the crash data from 1999 - 2012 presented at the meeting confirmed what the audience was already aware of: Montezuma Road is not safe. BikeSD representatives, the CCAC, various members of the community and Brian Genovese himself all agreed that the current state of Montezuma is unacceptable. The biggest problem was identified as speed of motor vehicles. 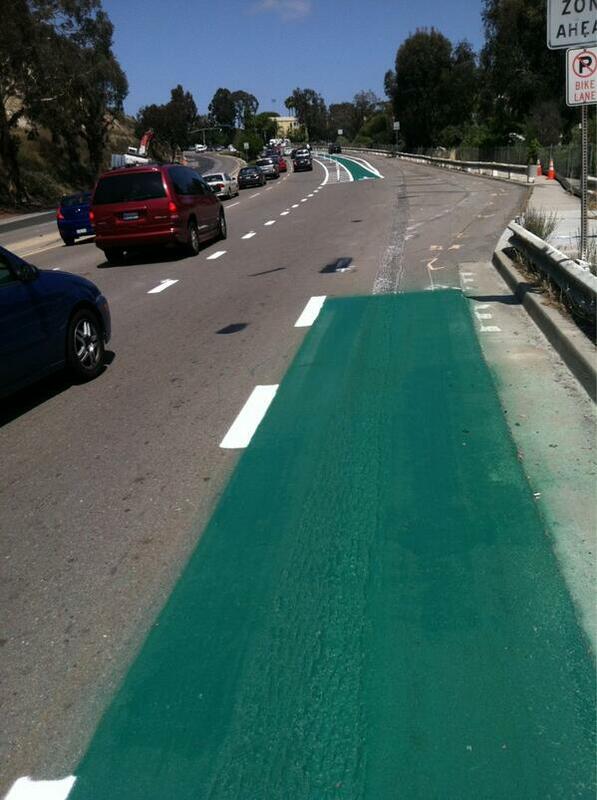 When Genovese’s division tried an experimental approach to creating a safer cycling environment by installing a green painted section along Montezuma leading to the intersection with Collwood, many were excited to see this use of innovative new treatments. However, after four months of mounting opposition from within the City’s Traffic Engineering Section, much of the paint was removed. This defeat is representative of the current disaccord among engineers in the Multimodal Division. The Division at present lacks any type of consensus on a forward-thinking, broad-based progressive approach to dealing with capital improvement projects and instead adheres to a myopic view of individual endeavors. Genovese vowed to continue in his fight for improvements along Montezuma using low-cost, low-effort strategies. These strategies refer to going after what he called “the low-hanging fruit”. According to Genovese, there are a large number of capital improvement projects currently underway that involve asphalt overlay, or repaving and re-striping roads. By simply identifying the opportunities to realign the paint on these streets in accordance with the City’s Bicycle Master Plan and current accepted guidelines for lane widths and design treatments, new and/or better bike lanes are able to be added at no additional cost. 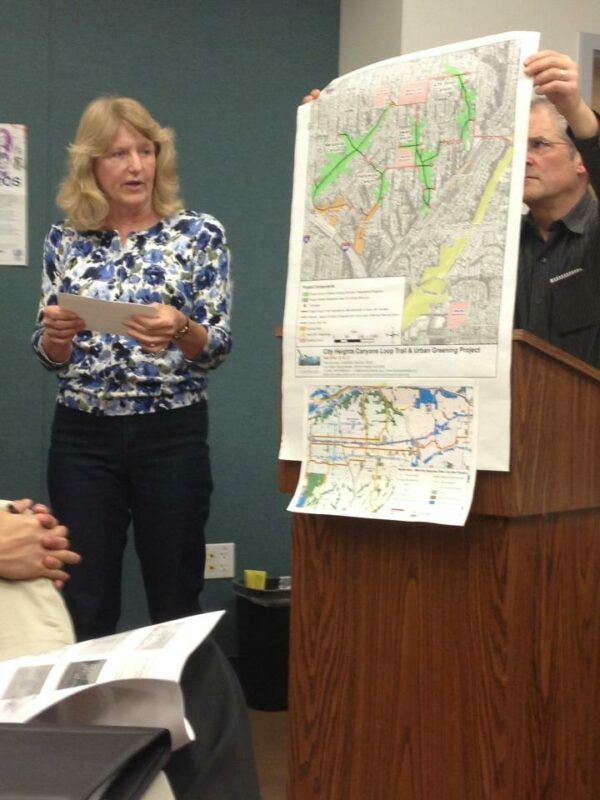 Joan FitzSimons Explains a Proposed Greenbelt Project Along Fairmount Avenue. Photo: Marzhel Pinto. Many attendees of the CACC meeting expressed doubts about the prospect of anything actually being implemented along Montezuma Road. Brian Genovese assured the audience that San Diego was ripe for change and likening the current momentum of the cycling movement to a juggernaut. Meanwhile, this proclamation seemed to be reaffirmed by Kensington-Talmage Planning Group member Joan FitzSimons’ announcement of a planned greenbelt along Fairmount Avenue connecting the San Diego River Watershed and Chollas Creek Watershed. The City of San Diego and the City Heights Community Development Corporation have filed an application for a $300,000 CalTrans grant. This regional pilot project would implement the Complete Streets Act and span from the I-8 Freeway all the way to 47th Street, traversing seven different communities and supporting multimodal transport as well as healthy, sustainable and green communities. Plans include a linear parkway with separated bike facilities and tree-lined corridors. Juggernaut or not, the cycling community now has the attention of planning groups, traffic engineers, city council members and even the Mayor’s office. It’s up to us to hold them accountable and make sure they follow through with transforming San Diego into the world’s best city for bicycling. Edit: To view the entire presentation that was presented at CACC, click this pdf link. Correction, March 22, 2013: This post has been updated to reflect the fact that the $300k grant has been applied for but not yet received. It has also been updated to show that the applicants are The City of San Diego and the City Heights Community Development Corporation and the boundaries of the project are I-8 and 47th Street. Thanks to Randy Van Vleck for providing this information. 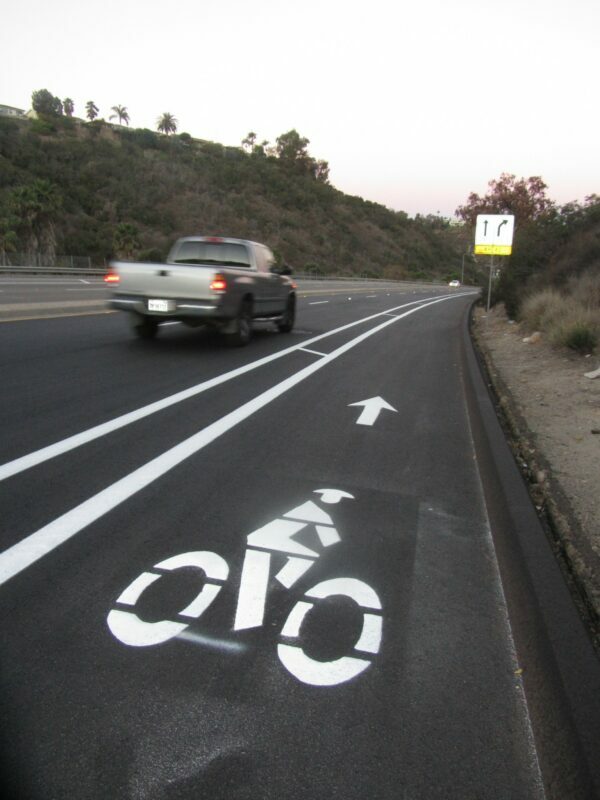 Tonight's College Area Community Council meeting has an item on its agenda that is of importance to us: city staff will be making a presentation about their plan for early action striping modifications on Montezuma Road to improve bicycle safety along the corridor from Fairmount Avenue to El Cajon Blvd. The presentation will be at the College/Rolando Public Library located at 6600 Montezuma Road, San Diego, CA, 92115 and the meeting is scheduled to begin at 7pm. We're hoping that today's presentation has taken the recommendations made by the College Area Community Council and our supporters from last November into consideration.